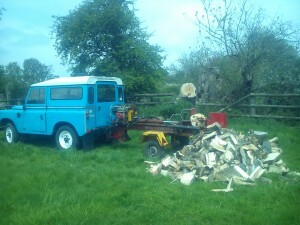 Mark’s Mobile Log Splitting service offers on-site wood splitting for your home or business. We are able to split your firewood on-site using our mobile hydraulic log splitter on fallen trees or trees that have been felled by a tree surgeon. We tow a splitter so we can access Gardens, Estates and Woodland directly if needed. Usually, two of us come with the machine to speed up splitting. The split logs fall to the back and side.Leaving a pile of logs to cover over, or wheelbarrow into dry storage.